T Rex Cafe Restaurant Review | Is This a Must Do or Skip? Disney World has hundreds of themed restaurants taking you to other countries, to other decades, and even back 200 million years. Imagine your family’s reaction as you are greeted during your next meal at Disney World with a 15 foot Tyrannosaurus Rex roaring at you! Even as an adult, I feel a little weary as this dinosaur glares down at me. This one of a kind experience for the whole family is called T Rex Cafe at Disney Springs. The T Rex Cafe at Disney Springs is more than just a restaurant. You can shop for your favorite dinosaur attire, rocks, toys, and souvenirs at the gift shop called Dino-Store. At the back of the Dino-Store, you can even build your own dinosaur from scratch. If you love the Build-A-Bear Workshop, you will enjoy this same experience, but with dinosaurs. Both Kelly and Hunter love building a dinosaur at this workshop. It is a fun activity and souvenir! While you wait for the host/hostess to call you for your table, you can even take the kids to the Paleo Zone, where they can learn in this educational area about the past. For the more active kids, take them outside to the Discovery Dig. This covered area next to the Dino-Store will keep the kids happy and busy, while you wait for your table. The kids turn into paleontologists as they hunt for dinosaur bones and fossils. They can also pan for treasures and get a little wet in the Discovery Creek. Once your name is called by the host/hostess, it is time to go back…way back, in time. You may be seated in one of many different areas of T Rex Cafe. In the Fern and Sequoia areas, you will be in the tropical area of T-Rex, you will feel like you are in the jungle with lots of vegetation. You will see hidden within the foliage huge wasps, triceratops and squawking pterosaurs. 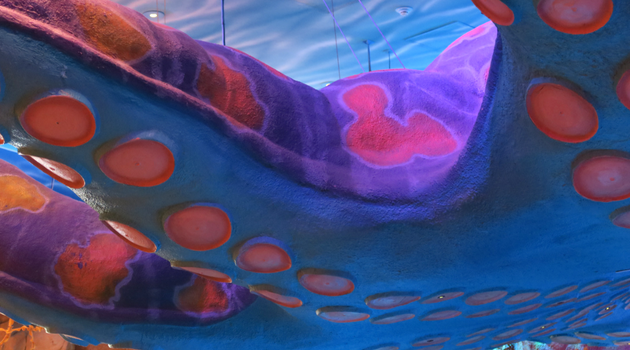 In the Coral section of T Rex, you feel like you are under the sea with a huge octopus above your head with tentacles dangling down. If you look closely you may even see a hidden Mickey within the octopus. You will also be surrounded by luminescent jellyfish hanging from the ceiling and fish aquariums. In the Geotech area, you will see the huge fire pit called the Kitchen of Fire and the volcano. Be prepared for more entertainment in this area as a meteor shower strikes about every 20 minutes at T Rex Cafe. You will see the meteor across the ceiling and down the wall and hear the loud crack of explosions. This meteor shower even strikes the most confident guest to wonder, did we go back in time? My favorite section of the restaurant is the Ice Cave. This section will give you an instant chill. The entire area is in a white icy cave that glows. You will see a huge full size dinosaur in bones that covers one section of the cave wall. 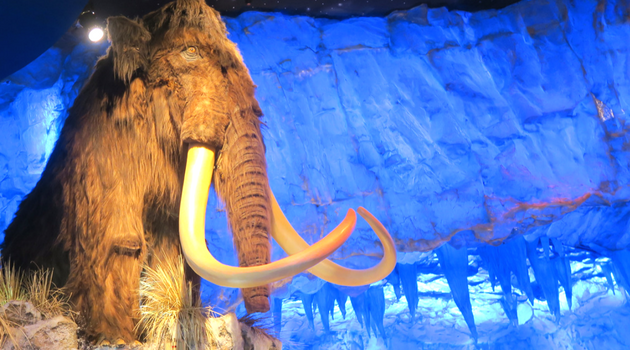 You will also see wooly mammoth animatronics that look lifelike. When the meteor shower strikes, the Ice Cave glows red and orange. It makes this area even more fun! The atmosphere alone at this restaurant makes it popular for guests of all ages. Come hungry because the menu is extensive for both plant eaters and meat eaters. The menu includes appetizers, soups and salads, entrees, and desserts. Appetizers include mozzarella fingers, quesadillas, chicken wings, flatbread, nachos and more. 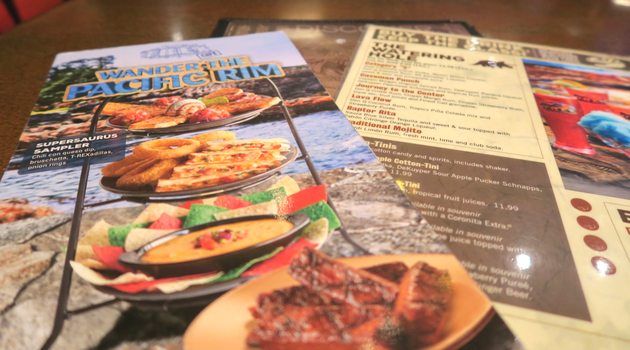 All of the menu items have fun names like Pterosaur Wings or Colosso Nachos. If you want to try a sampler of the appetizers, you can try the Supersaurus Sampler with several tastes. There are several soups and salads for the lighter eaters, including french onion soup, tomato basil soup, classic house salad, and more. For main dishes, there are lots of choices including hamburgers, chicken salad, steak and cheese sandwiches, lasagna, rotisserie chicken, shrimp, ribs, and more. From the restaurant, you can watch the chefs behind the wood burning open (called the Kitchen of Fire) as they prepare flatbread pizza and rotisserie chicken. These entrees satisfy even the hungriest dinosaur. Don’t forget to dive into the watering hole and enjoy one of the many adult dinosaur beverages, including the popular Cotton-Tinis like the T Rex Exclusive. This tasty beverage is cotton candy and spirits all swirled into a delightful martini. You even get a T Rex shaker as a souvenir. Don’t let the end get near, without dessert! You can enjoy several treats at T Rex Cafe including the popular Chocolate Extinction. This dessert is huge and feeds four people with chocolate fudge cake with ice cream, whipped topping, fudge, caramel, and Butterfinger crumbs. This restaurant is one of my favorite dining experiences with children, not only for the atmosphere, but for the food. The kids menu at T Rex Cafe is as extensive as the adult menu. They have thirteen different entree choices for kids, including ribs, mini corn dogs, mini hamburgers, pasta, and dinosaur shaped chicken. They can accompany their entree with side dishes like apple sauce, fruit, veggies, corn, and mashed potatoes. Of course, your kids will want to save room for desserts like Chocolate Tarpit and Saber-Tooth Sundae. T Rex Cafe is a whole family experience from entertainment to great food. Prices range from $8.99-18.99 for appetizers, $6.99-16.99 for soups and salads, $13.59-31.99 for entrees from $6.99-16.99. You can book this restaurant by calling 407-WDW-DINE, online at disneyworld.com, with your travel agent, or by calling the restaurant directly. Landry’s Club is Worth It! For additional value, be sure you sign up for the Landry’s Select Club. We LOVE this card! You can get a $25 welcome reward, priority seating (if you did not make an Advanced Dining Reservation) and even earn points for money off future dining experiences at any of the Landry’s Restaurants. We have just walked up to this restaurant and were immediately seated, even with a 60 minute wait. We love the priority seating! Transport back to the pre-historic era with a unique entertainment experience at T Rex Cafe. Check out a video of the T Rex Cafe during a recent trip to Disney World. We do love the theming of the T Rex Cafe. The fun theme and the priority seating with the Landry’s card are our favorites at this restaurant. You rarely can walk up to a Disney sit down restaurant. When we are visiting Disney Springs, we will go to T Rex just because we can immediately be seated. The food is good, but not spectacular. There are better restaurants at Disney World for the food. We love T Rex for the experience. What do you think of T Rex Cafe? 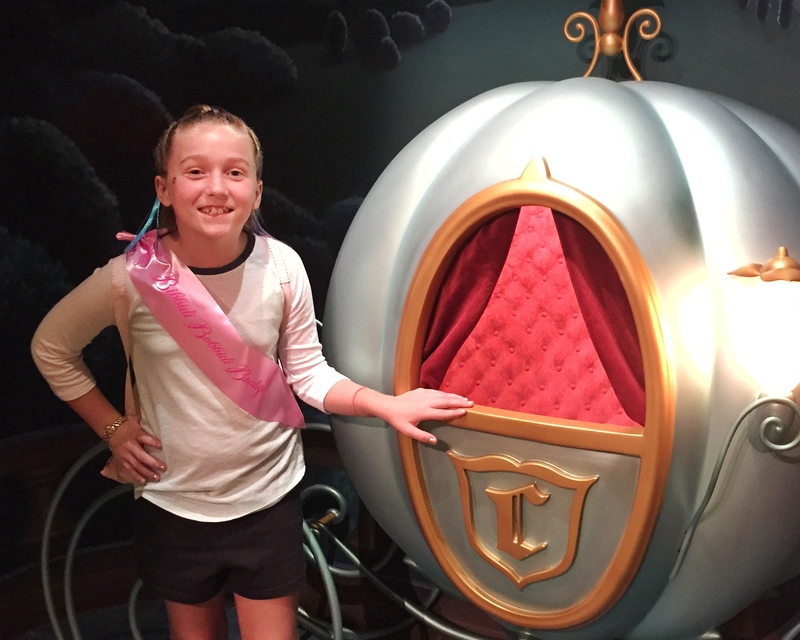 Here are some other article you may enjoy about Disney World.